Get out of your own head with a goat on your back. Trends come and go, but hopefully (hopefully!) goat yoga is here to stay. 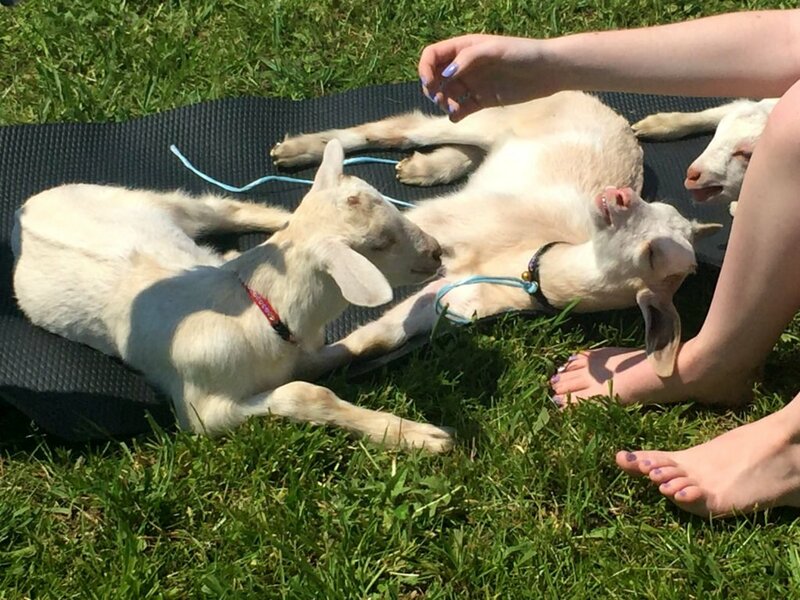 The art of practicing yoga with baby goats began last spring in Oregon, because of course it did. Since then, it’s swept the continental United States. 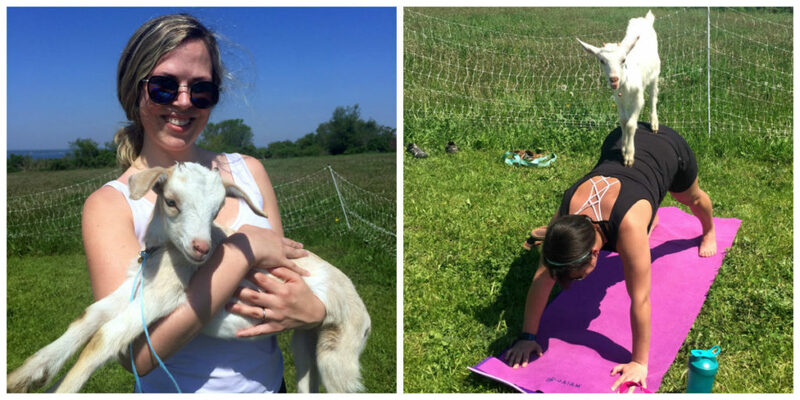 This spring, baby goat yoga made its way to Simmons Organic Farm in Middletown. As your faithful correspondent, I rolled out my mat and tried it firsthand. And, barnyard fragrance aside, I left feeling refreshed and really, really happy. Like, little kid happy. That’s me on the left with an actual little kid named Steve. My research associate, Abigail, is on the right. Simmons Farm is a treasure unto itself. 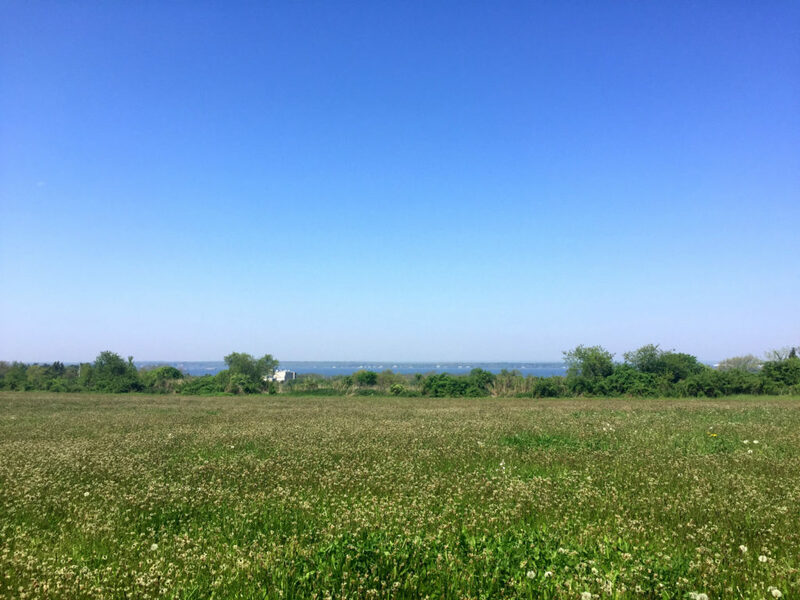 There’s a white farmhouse and a huge barn and a little green farmstand when you can purchase organic veggies, dairy, cheese and grass-fed meat. (Yes, they sell goat meat. It’s a cruel world.) On the day we visited, the farm’s owner, Karla, had a box of baby chicks up front for visitors to snuggle. I can still feel the ocean air catching in my throat. The breeze, the sun, the view, the baby goats, the gaggle of friendly women and one dude: It was a real pleasure to be a part of it. Local yoga instructor Christine Reed led the class, and you’d be hard-pressed to find a more perfect person for the job. We were all distracted. The baby goats nibbled our hair and climbed on our backs and evicted us from our mats so they could catch a quick snooze. I literally took this video of a goat eating grass when I was supposed to be in grasshopper pose. But Christine didn’t care. She’s a big proponent of mindfulness, and engaging with the goats around you is about as in-the-moment as it gets. Laughing about it is mindful, too. She was awesome. After an hour-long, beginner-friendly practice, we “ohm-ed” together as a group three times. Then, we stuck around for another fifteen minutes to gulp in the view, snuggle with the goats and gather the requisite photographic evidence. Yes, there was a lot of Instagramming and Facebooking and Snapchatting going on. But there was also a lot of spontaneity and silliness just for the sake of it — even if you signed up with a profile picture in mind. Me, I came for the story. Here it is: Goat yoga is really fun. And yoga mats can be cleansed of all barnyard smell with a quick spin in the washing machine. Simmons Organic Farm hosts goat yoga classes on Tuesdays and Fridays at 6 p.m. and Thursdays at 11 a.m. Tickets are $20. Family goat yoga (one parent/one kid) are held on Saturdays at 4 p.m. Tickets are $25. 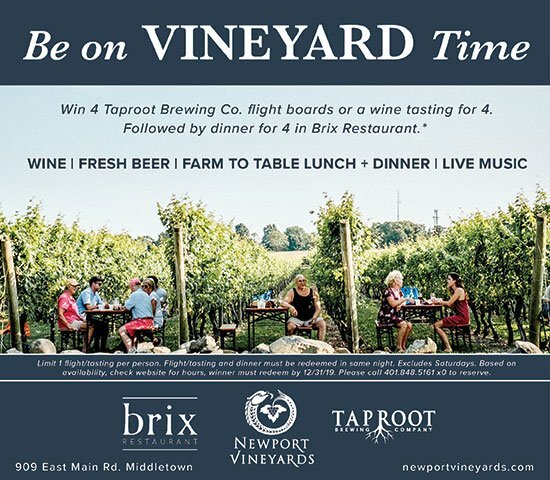 For more information, visit simmonsorganicfarmri.com.